In America’s embattled newspaper industry, some business innovations are showing clear signs of success, according to a new report by the Pew Research Center. While many of these are occurring on the digital side, some papers are generating new print revenue-through circulation gains, niche products and even sales reorganization. The report follows a year-long effort to identify newspaper successes in the search for new business models. This report analyzes four such dailies whose executives explained, in detail, the motivation and strategy behind their experiments and shared internal data about the results with the Pew Research Center’s Project for Excellence in Journalism. The Santa Rosa (Calif.) Press Democrat (circulation 53,292). As part of a revamped business plan, the paper developed the Media Lab, a sophisticated digital agency that provides a full range of online marketing services to merchants. In its first year, the lab accounted for roughly 25% of the paper’s digital revenue and is expected to grow revenue by about 60% in 2013. Manage the digital and legacy businesses separately (Deseret News). Deseret News Publishing Co. CEO Clark Gilbert has a theory of media evolution. The legacy business is the crocodile, the prehistoric creature that will shrink, but can survive. The digital business is the mammal, the new life form designed to dominate the future. And they need to be managed apart. 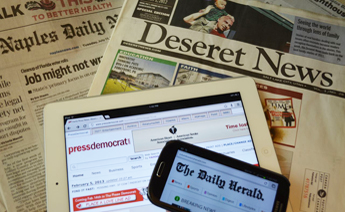 So the company created Deseret Digital Media to capture future growth, shrunk the Deseret News newsroom and reoriented the paper’s editorial mission. Keep developing niche editorial products (Daily Herald). In recent years, the Daily Herald management has rolled out a successful monthly health magazine and a new men’s lifestyle magazine and plans to introduce a real estate product early in 2013-keeping many of the costs in-house. It seems an ambitious enterprise for a small operation with modest resources, but publisher Mark Palmer says the health magazine has been “very profitable” and initial results from the new publication are quite positive. Don’t give up on print. (Daily News) In Naples, where the print franchise is comparatively healthy, the publisher is bullish, saying “we are going to reinvent print” and envisioning a future where the print product could be customized for the individual consumer. At many dailies, where print revenues continue to plummet, that may seem overly optimistic. But the lesson from Naples is that in communities where conditions are favorable, a substantial bet on print can still pay off. One is strong, aggressive leadership or what media analyst Gordon Borrell describes as “clarity of vision.” The styles of leadership at these papers range from Deseret CEO Clark Gilbert’s academically oriented theories about business disruption to Columbia Daily Herald publisher Mark Palmer’s determined pursuit of every dollar lost to the economic downturn. But the leaders at these papers are risk takers who concluded that the biggest risk was not rethinking their business models. Another is the ability and perseverance to get the buy-in necessary to change the internal cultures in an industry where that frequently proves difficult. Indeed, 10 of the 13 newspaper executives interviewed for Pew Research’s March 2012 report identified internal tensions between the legacy and digital cultures as the biggest challenge to business success. Some of the executives profiled admitted that implementing cultural change was among their most daunting task-with plenty of early resistance, whether it was getting former competitors to work together in Salt Lake City or convincing account executives to embrace more autonomy in Naples. A third is a commitment to improving the quality of the editorial product, even with reduced resources. In the case of the Deseret News, the response was not only to shift the focus of coverage from general interest to faith and family, but to dig deeper into those topics with more ambitious, enterprise reporting. At the small Columbia Daily Herald, it meant hiring an investigative reporter from Detroit. Several publishers spoke openly of the need to improve the news product and these organizations view quality as essential to “keeping the franchise” and building revenue.